Hackney New School is a school focused on music. Founded in 2013, it provides students with access to the widest range of opportunities in life by fostering academic excellence and instilling self-belief, intellectual curiosity and responsibility towards others in society. 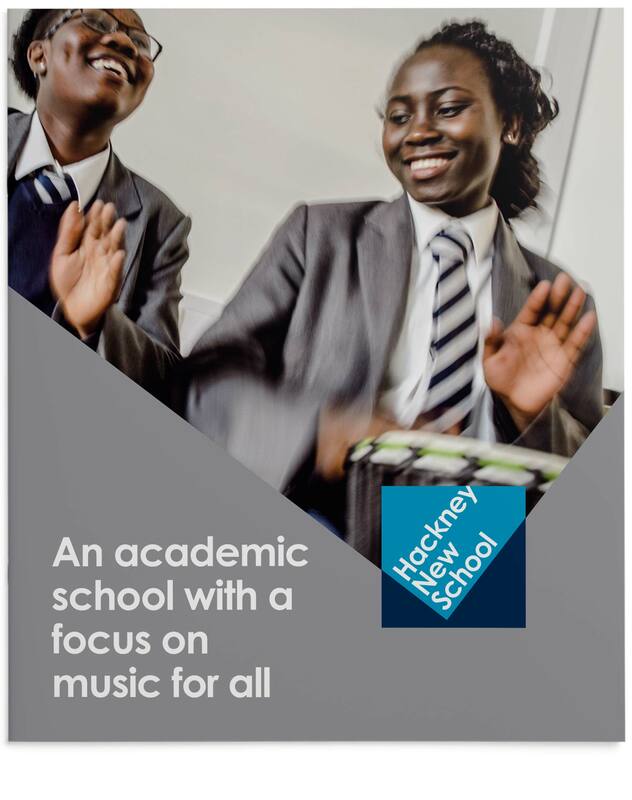 Hackney New School – a newly-founded school focused on music – approached us in 2014 to develop their brand and promotional materials. They wanted an identity that was confident, modern and professional and the identity needed to work for both the secondary and primary school. We developed a concept around the idea of achieving, with a strong graphic mark to represent a tick within the logo. The typography is set at an angle which helps to convey the school as a dynamic, progressive organisation. The whole logo graphic is formed from a square and this made it easy to apply as a school badge on the new uniforms. Uniforms follow the colour scheme we introduced, using dark navy blue and grey for the secondary school and grey and red for the primary school. Carrying the theme on, we designed the prospectus in a square format to further reinforce the identity. As the school developed, we created new logos and a prospectus for its primary school and proposed sixth form. We also designed and built their website.